We all know the feeling, the endless day to day grind of working, and the slow decent from the “new job” high to the less exciting realization that work can’t always be the magical dream you had hoped for after college. This feeling affects us all, no matter how wonderful the work we are doing. Recently I have found that in order to find fulfillment in our work we must seek out the meaning of what we do beyond the day-to-day experiences we face. This blog post is about how in just one week I was able to redefine my purpose at B-Line and how taking opportunities to share who we are can change the attitude we have towards our jobs and our world. I was given the amazing opportunity of attending the Go Green Conference, where political leaders, business owners, and people just like you and me converged to have the discussion around sustainability. It was quite inspiring to have an entire auditorium of people who shared this unified vision, a vision for a better future. The energy seemed to be contagious, yet still contained in a way that made this future seem possible. These people had the skills and the power to make great things happen, and they were obviously doing so. There were panel discussions with a cross section of the industries leading in sustainability, from solar energy to clothing companies like Nike and Columbia sportswear. We were addressing the questions facing this movement, the legitimacy of its financial sustainability to its impact on our communities and government. I think that the most important key to this conference was the network we were developing; it was fascinating to see the emergence of a wanted change in all arenas of society. Sattie Clark of VOIS said in the beginning of the conference, “Businesses that care about the future are the best vehicles for social change”. This statement had always been a tricky one for me, the question of whether this current business “system” was capable of creating the genuine change we seek, but as I sat there amongst some of the most passionate and influential people in my community I realized that if we stood together with the goal and shared vision of making our world a better place, this was no longer a dream, it was possible. This realization took me out of my own world, from the day-to-day grind of riding the trike around town, to connecting my work with others’ and how together we actually are changing the world. It’s not often that you feel this sort of transcendence from your individual actions, to a larger understanding of how your community is acting together in unison. This light bulb moment helped me to see the true potential that businesses have to offer social and environmental movements, but I felt the lingering questions of how transformative we can actually be without the push coming from the greater part of society, the people. The question of “grass-roots or top-down” change. I was able to grapple with these thoughts for a few days before something extraordinary took place. On October 6, 2011 our little-big city of Portland, Oregon was changed. For the first time in my life, I experienced a glimpse of true people power. B-Line had made plans to distribute Guayaki Mate on the Portland State University campus, but with news of the massive Occupy WallStreet protest expected to happen we quickly changed focus to attend and show support for this movement. On a seemingly unexpected Thursday afternoon, we saw something spectacular take place at Portland’s waterfront park, a union of 10,000+ people came together to take a united stand against the misleading and destructive practices of our worlds economic and businesses models. This movement was led by the 99%; the people who make up the fabric of our society but yet suffer the most when we are faced with trouble. B-Line and Guayaki made the deliberate decision to be a part of something that we felt was not only inspiring, but also essential to fulfilling our mission as two companies that exist for social and environmental change. 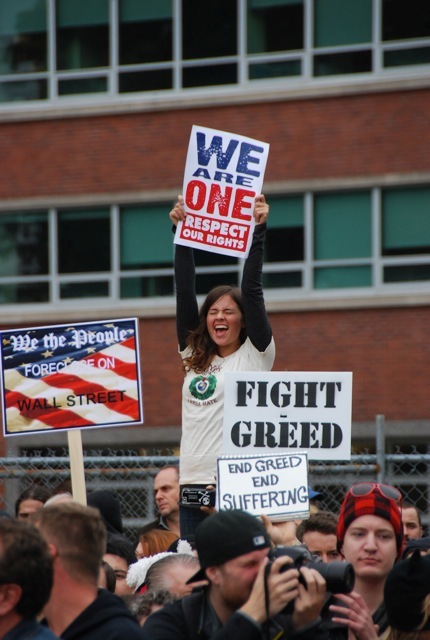 We were at this protest to share a new story of how business can work in our world. As I stood in the center of this magnetic and beautiful explosion of hope and unity, I began to realize that the same energy I felt in the Go Green Conference was present here. It was apparent that our world had a unified vision for equality, sustainability, and respect. I began to see that the 99% are not just the loudest voices at these protests but that they are a combination of the people and businesses fed up with the status quo. I was at this protest not only sharing my voice, but also sharing the voice of B-Line. Businesses like these allow for us to create solutions that are just and beneficial to all of society, and invite innovative growth and endless potential for the masses. This fight has to be a collaborative effort against the powers that say neither people nor untraditional business methods can win. The shift we desire is possible, we just need to find the space to share our visions because I have a feeling they will fit closer than we had though. So here I am, rejuvenated and ready to make my voice heard: to create a new story where businesses do care about people and are supported by people who care about better businesses. We can do this.